I’m not Jewish but I’m always interesting in trying food for Hanukkah. In fact, this post should be renamed to 17 things I want to eat. I love discovering why food around the world was created. For example, cholent stew exists because Jewish laws prohibited cooking on the Sabbath. But luckily a stew can be made on a Friday before the sabbath and kept warm until the following day. Sometimes history is so freaking cool. But sadly, I haven’t tried all of these foods. And so I hope this post encourages one of my Jewish friends to invite me over because food for Hanukkah looks so good. The Jewish holiday, Hanukkah/Chanukah, also known as the festival of lights is an eight day and night celebration. This year, Hanukkah begins at sundown on December 2, 2018 and ends the evening of December 10, 2018. Traditional food for Hanukkah are fried or baked in oil, as Hanukkah celebrates the miracle of oil. A small amount of oil kept the flame at the Holy Temple lit for eight nights, instead of one. Here are 17 popular dishes served during Hanukkah and other Jewish holidays that are on my must-eat list. 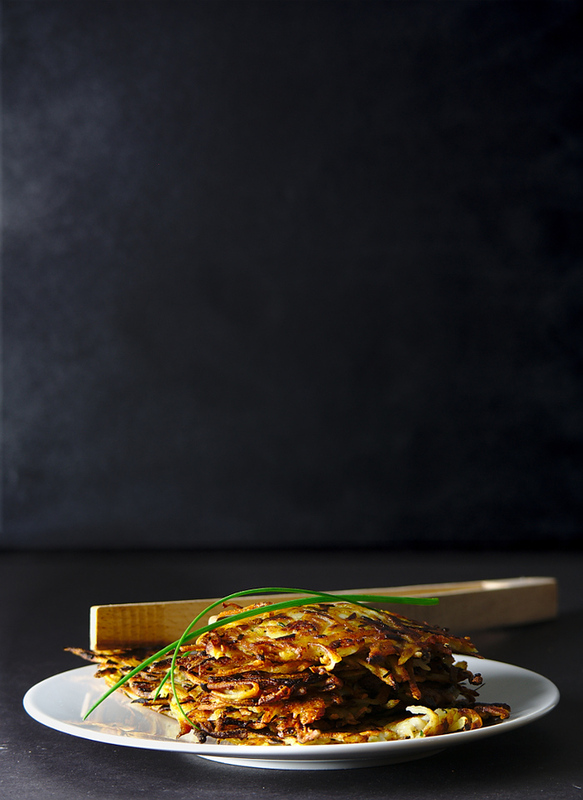 Latkes are small fried pancakes. Today, they are made in a variety of ways, from savory to sweet. They are commonly made with grated or mashed potatoes, flour, egg, cheese and seasoning. They can also be served in a sweet form, most popularly made with apples. Brisket is a tough cut of meat from the lower front breast of a cow. Traditionally, it was a popular choice for a special occasion as it is a large cut of meat, at a low cost. Today, the popularity of brisket has raised the cost. Short on time? 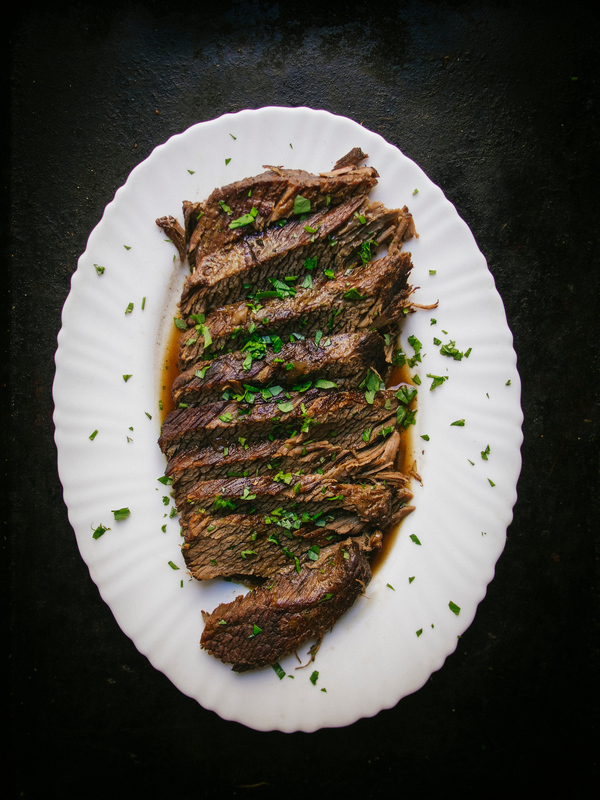 Check out this recipe for Instant Pot Braised Brisket. 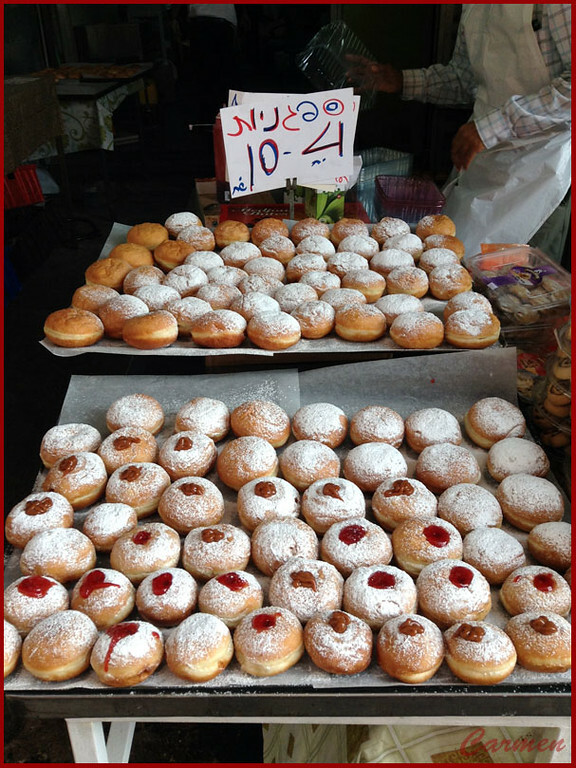 Sufganiyot (pronounced soof-gone-YOT) is a deep fried jelly doughnut. Traditionally they are filled with fruit jelly or custard and rolled in powdered sugar. They are best served warm but are still delicious cold. You can make them at home or purchase them a Jewish bakery. 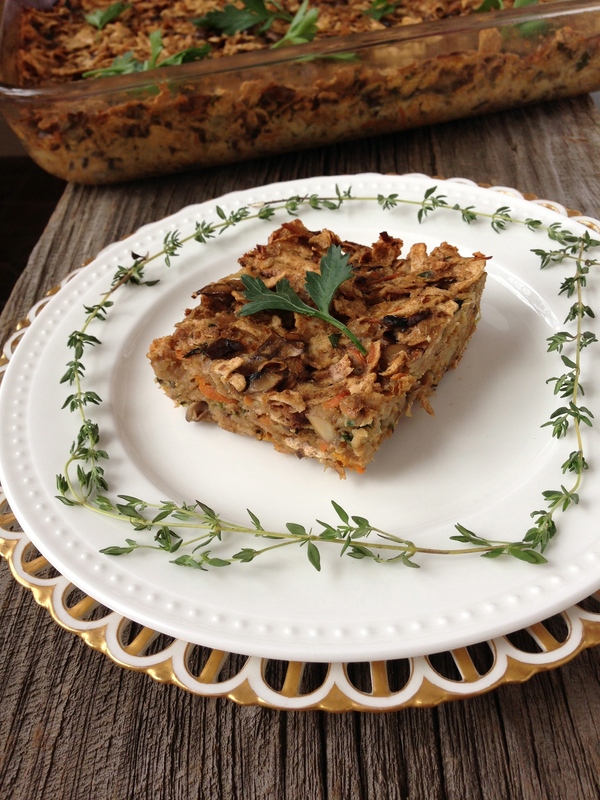 Kugel (pronounced koogel) is a pudding or casserole, traditionally served at Shabbat or during a holiday meal. It is served as a savory side dish or a sweet dessert. Today, the recipes are diverse. As a side dish, it typically includes potatoes, egg and onion. As a dessert, it is made with an egg based puddling that includes, noodles, fruit and nuts. 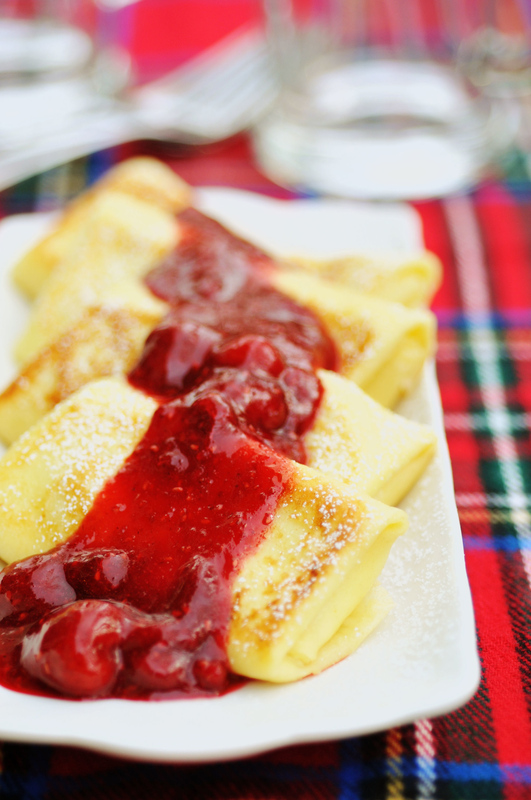 Similar to a thin pancake or crepe, blintzes can be made as savory with cheese or sweet with fruit, and are fried in oil. They are easy to make; fry the batter on one side, fill with cheese, potatoes or fruit, fold in the filling and fry again. They can be topped with sour cream, apple sauce, berries or powdered sugar. 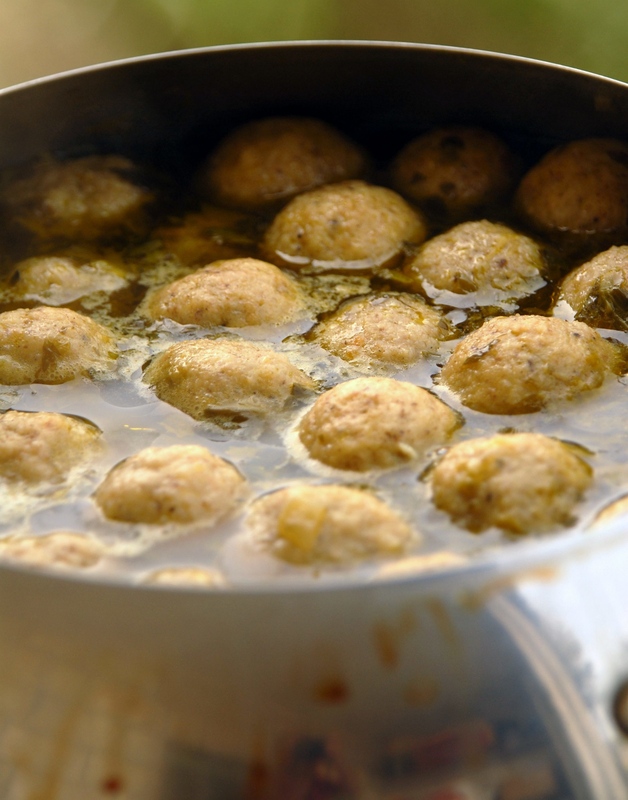 Matzah balls are dumplings made with matzah meal (breadcrumbs made from matzo crackers), egg, flour and may contain schmaltz (chicken fat) or oil. Cooked in chicken soup, they may have a light or dense texture to sink or float in the soup. 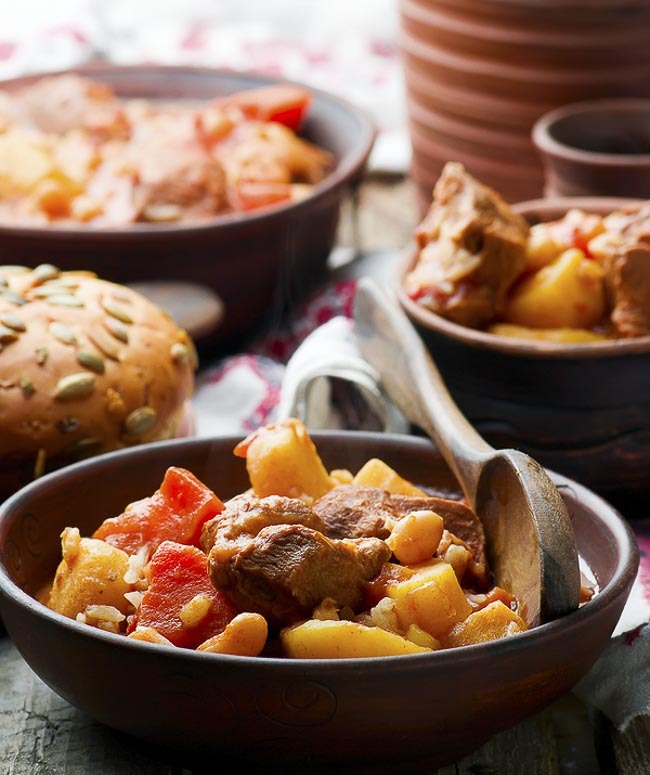 Tzimmes (pronounced Tsi-miss) is a sweet stew traditionally served at Rosh Hashanah. This food symbolizes hope for a sweet new year. It is made up of carrots and honey, and has many variations including sweet potatoes, dried fruit, prunes, brown sugar, apples and meat. It is typically served as a side dish. 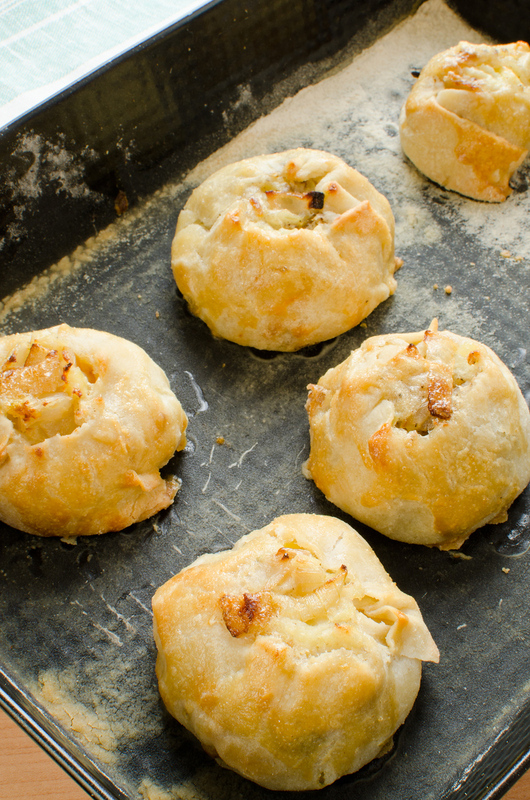 A knish is usually a baked dumpling pastry. However, it is also fried or grilled with a savory filling. Often served as a small appetizer or larger as a snack with a potato and onion filling. Also, it’s common to find recipes with meat, kasha, sauerkraut, cheese, etc. Gefilte fish is traditional during Shabbat and other holidays by Ashkenazi Jews. It is deboned white fish, onions, vegetables (carrot, celery, parsnips, etc. ), eggs and matzah meal; formed into balls or patties. It is often served as an appetizer. It can be purchased in a bottle or frozen form. 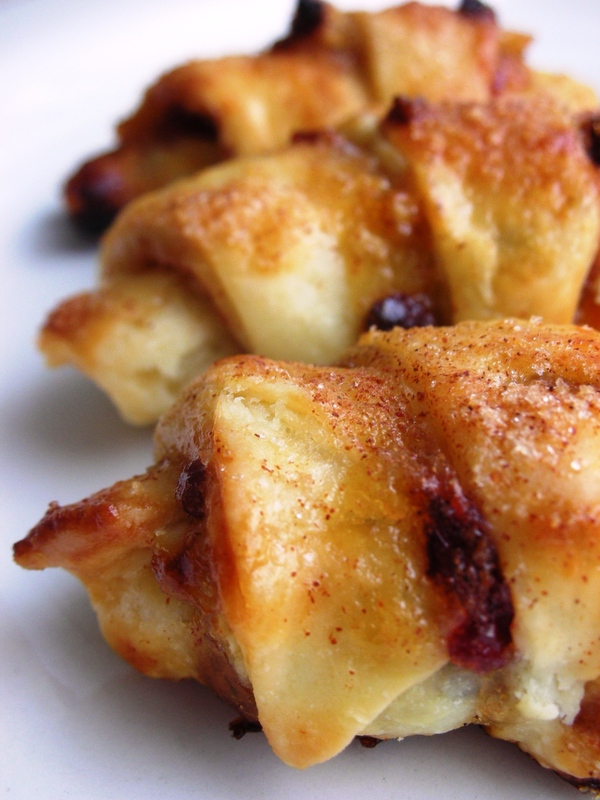 Rolled flaky pastry cookies, rugelach often features cream cheese or cottage cheese. However, non-dairy ingredients versions exist. It’s a simple recipe with triangular dough rolled with sweet ingredients, such as jams/jellies, chocolate, raisins, nuts, etc., to create a crescent shaped cookie. 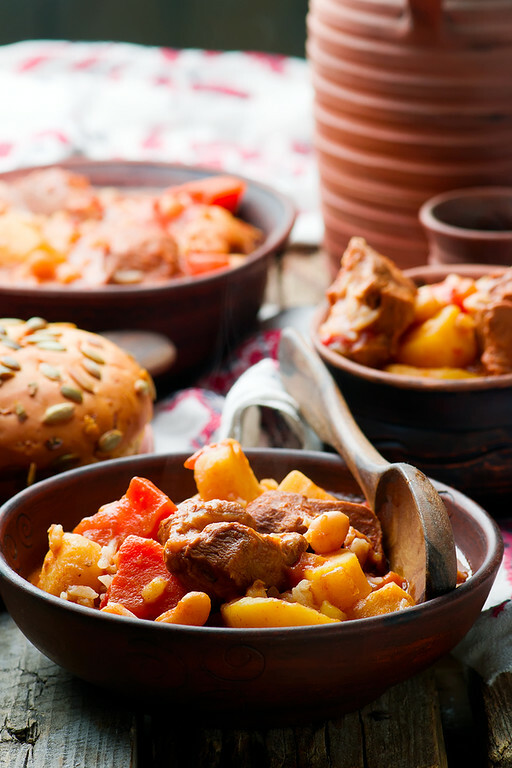 Cholent is a slow cooked stew, traditionally made for lunch at Sabbath. And so as mentioned above, this stew simmers overnight to comply with Jewish laws. It also can be cooked in a crock pot on a low setting. The stew contains meat, potatoes, beans and barley. But there are many variations and names for the stew. 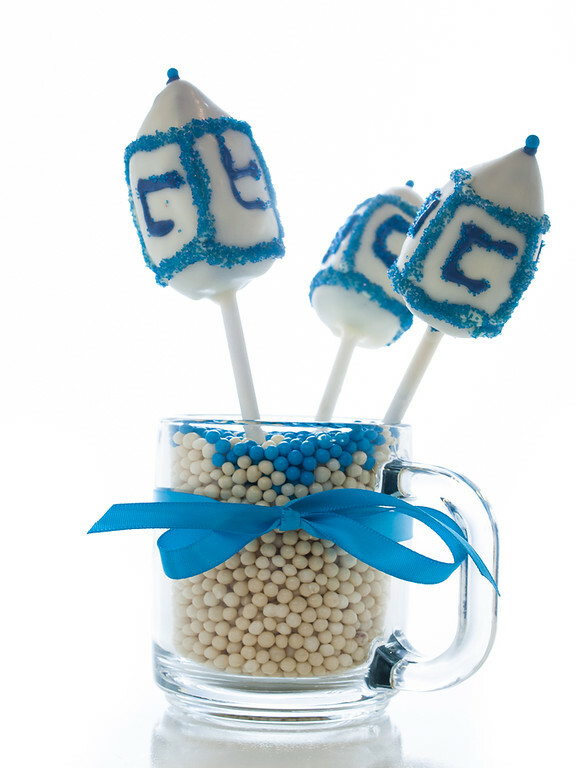 Bimuelos (pronounced bim-WAY-los) are a sweet Hanukkah treat. The name may sound familiar as we shared they are a close relative to the buñuelo Spanish and Mexican Christmas cookie. Fried dough fritters, topped with sweet honey or sugar syrup and powdered sugar. Bimuelos are delicious warm when they are crisp but soft inside. 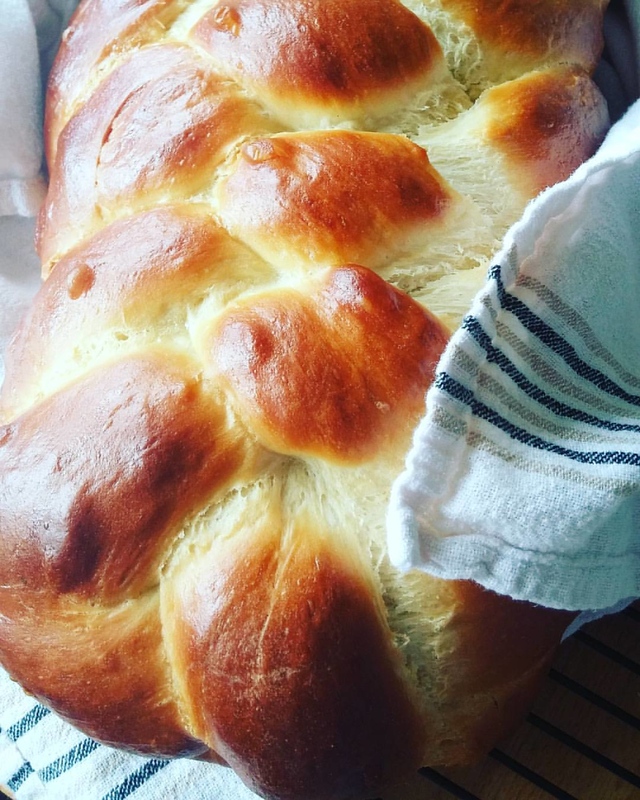 A sweet egg bread to eat during Sabbath. Challah features braided dough with three or six strands of dough. However, on other holidays, it exists in different shapes. For example, Rosh Hashanah features a round challah bread to symbolize the cycle of life. Short ribs are becoming a popular food for Hanukkah as they flavourful and tender meat. While they are a fatty meat a serving size isn’t as large as serving a brisket. As you know, everything in moderation. Many recipes recommend for the ribs to sit overnight, if you want that ‘melt in your mouth’ dish. Although you can’t spin these cookies the kids (and adults) will love them. And, you can fill them with candy, raisins and nuts . Holishkes also known as galuptzi or praakes, are stuffed cabbage leaves traditionally served for Sukkot and Simchas Torah. Stuffed with meat and simmered in a sweet and sour tomato sauce, as an appetizer or a main dish. 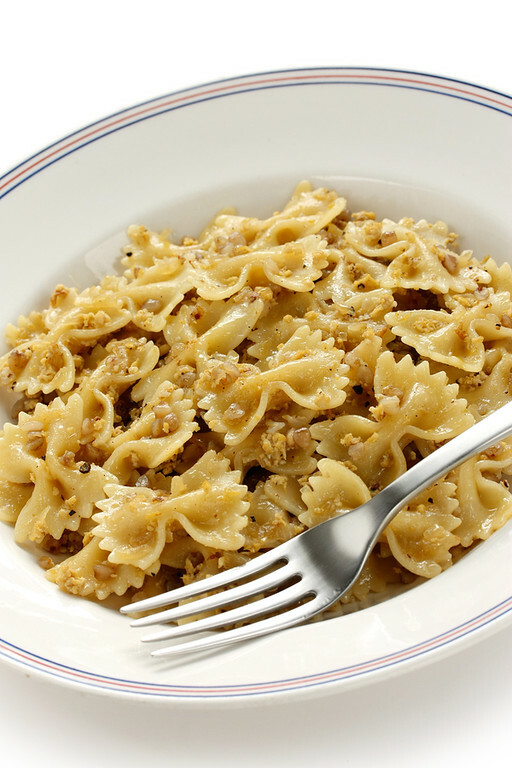 Kasha varnishkes/ kasha varnishkas is a simple comfort food, made up of roasted buckwheat groats, bowtie noodles and caramelized onions. Traditionally, this was a popular dish, due to the low cost. Also, it is served as an appetizer or side dish with brisket, chicken or more. What did I miss? 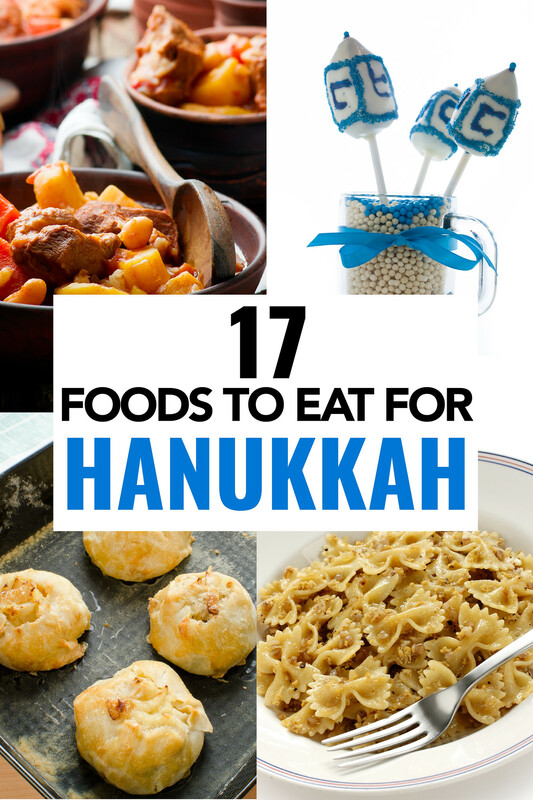 Is there any food for Hanukkah that you think I should add? Let me know in the comments below. Great post! All are my favourite dishes. All foods that are featured are so mouth watering! Reading this made me hungry! I really love the photos, foods are nicely captured and really looks delicious. Thanks for sharing these wonderful foods for Hanukkah,they all look so scrumptious. After that photo, there’s no way I’m not making braised brisket for Christmas this year! What a delicious post and detail you shared with us. These pictures looks so mouth watering food. Thank you so much! !